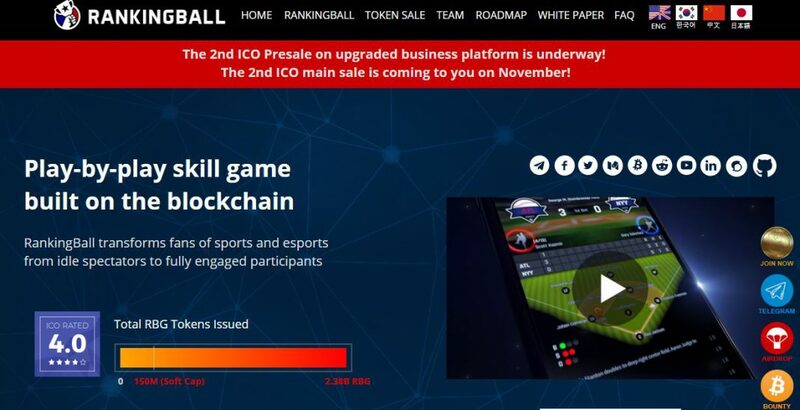 Ahead of #BOSCON18, SBC Americas caught up with RankingBall Digital Marketing Manager Camden Bernhardt, to find out more about this innovative DFS platform. What our games are trying to do is bridge the gap between fans and sports leagues, and trying to bring fans closer together through a media platform. Right now we only have the game, but in the future we hope to end up doing something similar to what Twitch is doing – having these media streaming games. We work with sports and esports so we want people to be their own commentators of their own games and take that idea of Twitch and put it into our platform. Blockchain on our platform right now is used as an entrance into a contest, so it could be used for entering and winning a contest as a prize. Like I said, in the future when we start having these Twitch features, you’ll be able to tip the viewers in exchange and also viewers can have their own blockchain contests when viewers can come on in. Another thing is we’re going to have a marketplace inside the game which will be only using the tokens. Our business definitely involves the European market. Right now we have the euro soccer and one of the things we found is that fantasy sports aren’t really that big in Europe. We’re based in in Seoul, and a lot of Koreans that have come on to our site have no idea what fantasy is either, but once they’ve joined they get to learn some of the sports that they’ve never even heard about – like the NFL or baseball. They’ve actually been able to learn through our game, the rules, who the players are and they’ve enjoyed watching the game. So it’s kinda like a step into fantasy sports. RankingBall will host a Roundtable from 14.40-15.40 on Thursday, while also hosting a stand at position J26. Access the full #bosweek agenda here.